The CENTER for Advanced Parathyroid Surgery’s number one priority is curing patients of hyperparathyroidism so they can enjoy life again! At the CENTER, Dr. Larian and his team take a comprehensive approach when assessing patients to appropriately confirm a diagnosis of hyperparathyroidism, and differentiate it from other causes of hypercalcemia. One of the most common questions our hyperparathyroid patients ask during their surgical consultation is, “How big is my scar going to be?” Since Dr. Larian knows scarring is a big concern for his patients, he only uses a minimally invasive approach to surgery, with an incision that is approximately 1.5 centimeters in length. Additionally, Dr. Larian utilizes a plastic surgery suture technique to make sure the incision heals beautifully and practically invisibly. Patients are always amazed at how well the incision heals and often times tell Dr. Larian that they can’t even find their own scar. Although it is often thought that minimally invasive surgery simply means a smaller incision, and therefore a smaller surface scar, it is important to understand that a minimally invasive parathyroidectomy also significantly reduces trauma and scarring to the tissues underneath the surface. This is vital in parathyroid surgery because of the glands’ proximity to other important mechanisms, including the voice box, trachea, and thyroid. Dr. Larian takes great care and precision when operating on the parathyroid glands so that these delicate areas are not damaged. Can you see the parathyroidectomy scar? 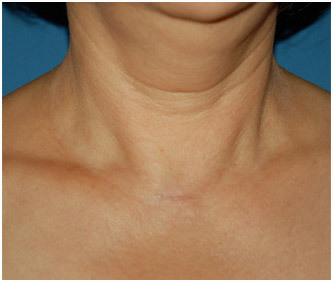 Visit our Parathyroidectomy scar gallery for more pictures. If you are a loved one are suffering from hyperparathyroidism and want to learn more about minimally invasive parathyroidectomy with Dr. Larian, please contact the CENTER today to schedule your consultation.